With cloud computing as the key to embrace digital transformation, many enterprises are leveraging Azure as a platform to realize its benefits. Using deeply-integrated Azure cloud services, such enterprises are rapidly managing simple to complex applications with ease. Today, 90% of Fortune 500 companies are using Microsoft Azure to power their business globally. As per the MarketWatch reports, Microsoft Azure shares over 31% of the cloud computing market in 2017 and has grown by 64% as compared to last year. Microsoft Azure has made significant advances over the years, offering strong IaaS and PaaS capabilities for enterprises to rapidly build powerful business solutions. It now offers a set of features and capabilities far surpassing its competitors. The platform offers application developers with the tools, building blocks, and environment needed to quickly deploy cloud services. It also provides the vital ‘Dev-Ops’ connections essential to monitor, manage, and continually fine tune the cloud apps. With Azure, much of the infrastructure management is taken care of behind the scenes by Microsoft, thus, allowing 100% focus on innovation. Let’s walkthrough few Azure development best practices that enterprises need to develop & deploy cloud applications rapidly. It's significant to understand the difference between web role and worker role along with their benefits. Choose them intelligently and decouple the application logic between them. Experts suggest utilizing distributed cache to build the stateless application. In addition, identify your static assets like images, JS files, CSS files, etc. and store them in blob storage. This will help in reducing the application package file. Managing the latency by co-locating the cloud service and data storage in the same affinity group will boost the application performance. Also, it is advisable to enable the "geo-replication" of storage using Azure Traffic Manager, thereby, helping in disaster management. Read how a 50-year-old company adopts Azure Site Recovery to recover quickly from disasters like Power failure, natural calamity, short circuit, and hardware failure. Owing to the cost-effectiveness, ease of use, and support for an extensive list of workloads provided by Azure, the company was able to achieve minimal downtime & monetary loss with the reliable, automated and cost-effective solution for disaster recovery and ensure Business Continuity. Hardware can fail at any point of time, and it is essential to safeguard the cloud services. Approaching small-sized VMs is better than acquiring fewer large-sized VMs, as they are not fail-safe and have transient local storage. Experts suggest avoiding large VMs until it is a necessity. Moreover, utilize the feature of Azure Backup that maintains the disk-based replicas on multiple locations for the online or on-premise applications. CDN caches the static assets like images, videos, JS, and CSS at a tactical location to get an utmost throughput, while delivering the contents to the users. It gives the best performance and user experience by distributing user requests between the application server and CDN. Moreover, Azure CDN offers the features of file optimization, video streaming optimization, query caching, and much more. Microsoft Azure partners like Saviant, are continuously helping enterprises realize the true benefits of such cloud services by offering their unique Azure development services. Azure Web Apps is a fully managed service that helps to develop and deploy enterprise-ready web applications rapidly. It offers powerful capabilities such as built-in development operations, continuous integration with Visual Studio Online and GitHub, staging and production support, and automatic patching for Azure developers to quickly create web applications. Read the blog to get to know the numerous benefits that Azure Web Apps Service has to offer. Azure table storage is aimed at storing loosely structured data. It does not support the features of relational database and indexing. Leverage Azure SQL Database in case of complex queries or data manipulation. Whereas Azure SQL Database is a shared database and offers a standard interface to administer your database. It is important to understand the limitations of the shared database before going for it. In addition to the above points, it is noteworthy to know about the Azure Active Directory, Platform Encryption, Log Mechanism, Rights Management and Data Security best practices, for secure, available, & scalable application development to avail the maximum benefits of Microsoft Azure and cloud computing. Top Azure development experts from the Microsoft partner community can help Enterprises to leverage Azure PaaS & IaaS and build & modernize enterprise apps. Companies running business-critical applications on Azure today, include various organizations from industries like Energy & Utilities, Logistics, Manufacturing, Government, etc. One of our customers in the US is experiencing the power of Azure to save billions of gallons of water every year with a Cloud-based Metering & Smart Analytics system hosted on Azure. 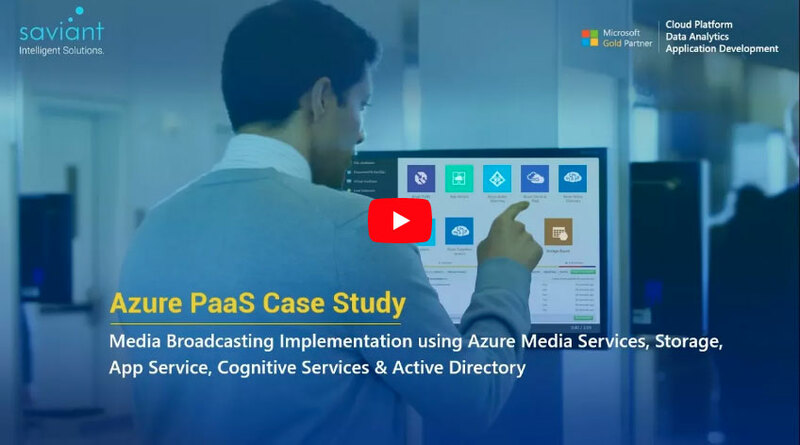 Check how our team of Microsoft certified Azure developers has developed a cloud-native application for a Media Broadcasting company by following the Azure best practices.